The 18 Challenges for Teachers in 2018 ©! Who’s ready to kick off 2018 with a bang? I am, and I have put together some AWESOME challenges for any teacher that wants to kick things up a notch in the classroom this year. This is Shake Up Learning’s annual 18 Challenges for Teachers for 2018! Inside this free, 83-page eBook download, you will find a series of 18 challenges that will challenge educators to try something new in their classroom in 2018! New ideas, new apps, new features, G Suite tips, and some fun extras along the way. I started this series in 2016 as just a list and infographic (see 16 Things for Teachers to Try in 2016). Then, in 2017, it became so much information that I offered it in the blog post and as a free PDF download (see 17 Things for Teachers to Try in 2017). For 2018, I am taking things a step further! I am issuing this is a series of challenges for educators to complete throughout the year. Since this is way too much information to fit in one blog post, 83 pages to be exact, I’ve put it into a handy PDF eBook download just for you! Oh! And for you loyal subscribers, I have a special surprise! Instead of asking for your email every time you want to download one of my freebies, you can now create an account and access the entire Members-Only Library in one location! Easy, peasy, lemon-squeezy! Read on to find out all the details, and about a special SURPRISE for 2018! This ebook started out as a simple blog post that just kept growing and growing! I had so much to share that I had to get in a format for you to download. In this ebook, are 18 specific challenges (outlined below) for educators. Some challenges are about technology integration, some are specific tools to try, things to read or listen to, some are strategies, and some are just tips and tricks. This is NOT about the tool! This is about transforming the learning in your classroom and trying new ideas in 2018! There is something in here for everyone! Additional links, resources, templates, and more! BONUS: coupon codes for PearDeck and InsertLearning!!! 18 Challenges for Teachers in 2018 FREE eBook! Get the FREE eBook: 18 Challenges for Teachers in 2018! Simply fill out this form and we will send you the 83-page PDF ebook. Now Available in Paperback and on Kindle! The 18 Challenges for Teachers in 2018 ONLINE COURSE! This year I created an online course to help you learn about each concept, idea, or app more in-depth AND earn all eighteen badges! How fun is that?! The course is video-based and completely self-paced so you can work on the challenges in any order you like. It’s learning on-demand! So if you want to dig deeper into each challenge and gets hands-on instruction and tutorials, and earn all of the super cool badges, check out the 18 Challenges for Teachers in 2018 Online Course. ENROLL TODAY in the 18 Challenges Online Course! Get your whole team, campus, or district to take the challenges! Let’s dig in! There is something in here for everyone, no matter what your role in education. There are strategies, concepts, apps, and ideas to help every teacher take things a step further in 2018! Are you ready? 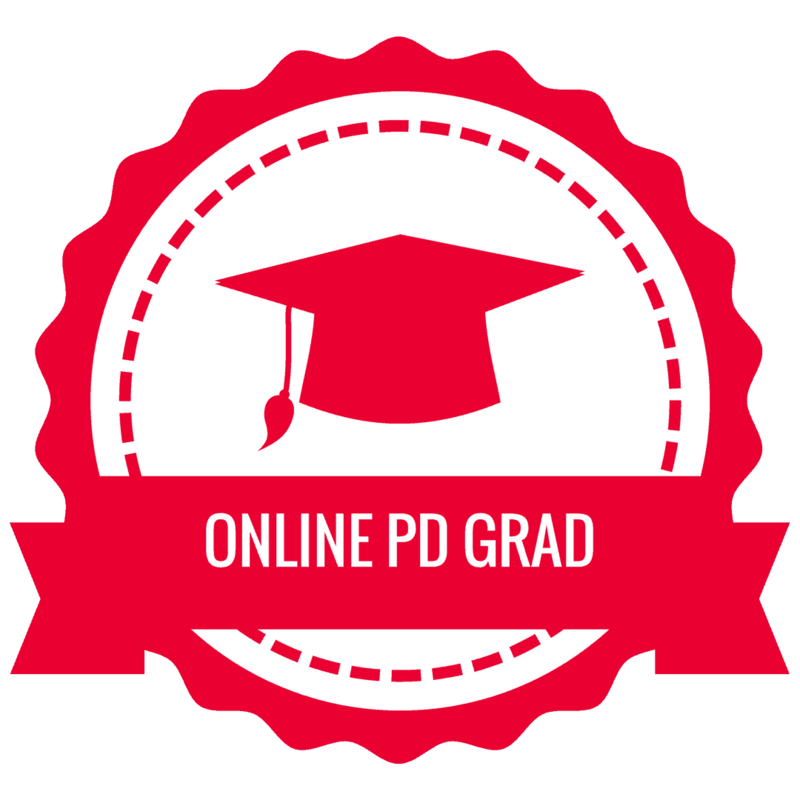 In this challenge, you will learn about all of the online professional learning resources available for educators. Discover all types of online learning from your favorite bloggers, the world’s best universities, and more. In this challenge, you will learn about cutting-edge technologies that allow us to tap into artificial intelligence and machine learning in the classroom, and even create with it! In this challenge, you will learn how to move from static learning to dynamic learning, and facilitate meaningful learning experiences that go BEYOND the traditional classroom. In this challenge, you will learn about powerful Add-Ons for Google Slides that allow you to create interactive learning experiences for your students. In this challenge, you will learn all about Google’s Be Internet Awesome program, including the Interland game that teaches students valuable digital citizenship skills, their free curriculum, and other free resources. In this challenge, you will learn how to differentiate and give students choice with interactive learning menus, including examples and free templates. In this challenge, you will learn about the power of publishing student work for a public and intentional audience, including tools and suggestions. In this challenge, you will learn about InsertLearning, an amazing Chrome extension that allows you to add interactive questions, notes, highlights, and more into any webpage. In this challenge, you will learn about podcasts, how to use them for your own professional learning, and a recommended list of podcasts for teachers. In this challenge, we will explore the possibilities for creating with 360 photography, including apps and ideas for multimedia projects. In this challenge, you will learn how to make the most of your online assignments by packaging all the information that students need in one location. In this challenge, you will learn all about the AH-MAZING New Google Earth, how to use it, and recommended resources. In this challenge, I’m sharing my favorite little tricks, or “hacks,” that allow you to share your G Suite files in the most convenient ways. In this challenge, you will learn how to find and use GIFs in your G Suite projects, as well as how to create screencast GIFs. In this challenge, you will learn how to use fun games from the Tonight Show with Jimmy Fallon in your classroom, including classroom integration ideas and some hilarious videos! In this challenge, you will learn how to create visual thinking activities for your students that will help them better process and retain information as they learn. In this challenge, you will learn how to become a member of Shake Up Learning and gain access to the free library of resources, cheat sheets, ebooks, and more! 18. Read the Shake Up Learning Book! In this challenge, you will learn about my soon to be released book, Shake Up Learning: Practical Ideas to Move Learning from Static to Dynamic. Using the form below, you can download the free, 83-page, PDF ebook and have instant access to all of the challenge. Take the 18 Challenges Course! Kick things up a notch and enroll in the online course that will teach you and challenge you all year long! Submit evidence for each challenge and collect all 18 badges. And earn 6 hours of professional learning credit! Get the eBook on Kindle! Prefer reading on the kindle app? I got you covered. The 18 Challenges for Teachers in 2018 is now available on Kindle. Inside this free eBook download, you will find a series of 18 challenges that will challenge educators to try something new in their classroom in 2018! New ideas, new apps, new features, G Suite tips, and some fun extras along the way.